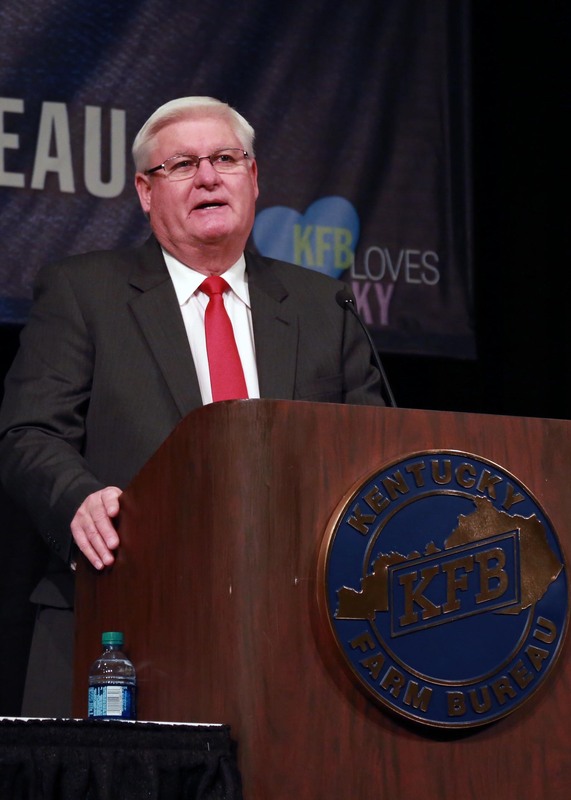 Louisville, KY (November 17, 2016) – More than 2,000 Kentucky Farm Bureau (KFB) members from across the state will gather for the organization’s 97th annual meeting November 30 – December 3 at the Galt House Hotel in Louisville, Kentucky. Delegates from all of the state’s 120 counties assemble for the four-day event to participate in committee meetings, business sessions, award presentations, officer elections and to adopt 2017 priority issues and policy revisions. In addition to conducting organizational business, KFB hosts its annual meeting to reflect on both the successes and challenges experienced in Kentucky’s agriculture industry over the previous year. A full agenda of delegate activities begins on Thursday, December 1, with 12 commodity and special interest conferences ranging in topics from tobacco and farm labor to beef cattle and water management. A one-day tradeshow – featuring agriculture associations and businesses from around the country, the KFB County Activities of Excellence and student agricultural science displays – simultaneously occupies the exhibit halls. Guest comments from Commissioner of Agriculture Ryan Quarles will highlight the day’s Commodity Luncheon. In between those activities and numerous other meetings scheduled on Thursday, attendees will take away valuable knowledge from the University of Kentucky College of Agriculture, Food & Environment’s presentation on the state’s 2017 Agricultural Economic Outlook. This much-anticipated session begins at 10 a.m.
During the morning general session on Friday, December 2, KFB President Mark Haney will update attendees with the president’s annual address. Fred Barnes, co-founder and executive editor of The Weekly Standard, will also speak at the session and his share thoughts on the political landscape in Washington, D.C.
Delegates will later discuss and adopt resolutions in the afternoon general session, then break into district caucuses to nominate the 2017 KFB Board of Directors. Saturday, December 3, begins with the organization’s annual Public Affairs Breakfast, highlighted by comments from Andy Barr, United States Representative, KY 6th District. The morning event is followed by the annual meeting’s final general session. During this session, David S. Beck will present his annual Executive Vice President Report to attendees. Voting delegates will conclude their gathering by electing KFB directors and officers, and with final discussion and adoption of resolutions. In other convention activities, the state’s “Farmer of the Year” and “Outstanding Young Farm Family” will be announced, awards will be given for county Farm Bureau achievements and top farm leaders will be recognized for distinguished service. Kentucky Farm Bureau is a voluntary organization of farm families and their allies dedicated to serving as the voice of agriculture by identifying problems, developing solutions and taking actions which will improve net farm income, achieve better economic opportunities and enhance the quality of life for all. For nearly a century, KFB has served as the “Voice of Kentucky Agriculture,” representing the interests of agricultural producers and rural communities. With more than 475,000 member families statewide, Kentucky Farm Bureau is the state’s largest general farm organization.